I’ve been talking a lot about domains and branding lately and in this post I’ll help you discover new social media possibilities when the brand you are setting up is already taken. Once you have secured your domain you’ll probably want to find matching Twitter, Facebook, YouTube, Pinterest, etc. profiles to support your new brand. We often find the perfect Social Names are already taken and we’ll need to get a little creative and find another solution. That’s what we’ll get into with this post – Your Brand on Social Media. Those of you that follow me probably already know that I’ve been preparing for a podcast launch for months. What you don’t know, because this is the first time I have announced it, is the podcast will not be called Hot Blog Tips. That’s right; my future podcast will be called the Content Creator’s Lab. I don’t want to go into all of the details here because its way off topic but the new brand requires that I secure social properties that will support it in the future. Since the new brand (Which will probably launch and stay on Hot Blog Tips in the beginning) is Content Creator’s Lab, I thought CCLab would be perfect for its social media name. But… you guessed it, already taken. Taken but not necessarily being used – CCLab on Twitter hasn’t tweeted since 2013. Oh well, this just means I need to get more creative. So here’s what I wanted; a uniform profile/page name and URLs that match one another, as well as my brand. For Hot Blog Tips, for example, I can say, “You can find us at HotBlogTips on every major social site”. I want to be able to say that with every brand I run, “You can find us at such-and-such on every major social site”. Okay, now we need to find our “such-and-such” name. We need to find a new social media branding solution since we were late to the table and ours is already taken. I took CCLab and added the suffix (word) “social” to come up with CCLabSocial. I so smawt. 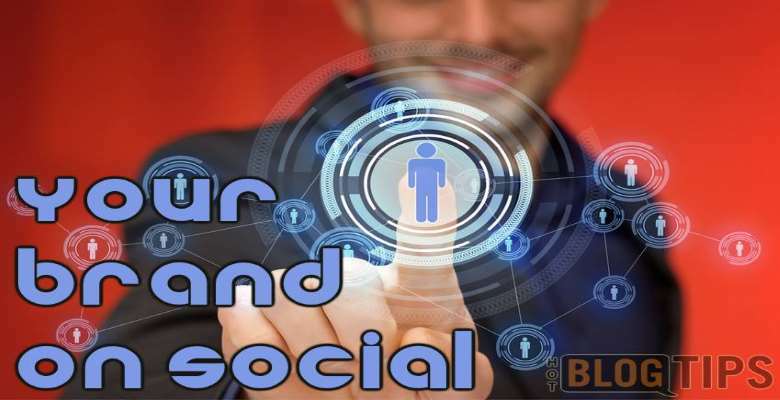 😉 That was my solution but your creativity is really the only thing limiting your next-best social identity – that and character restrictions along with each social network’s terms. Rather than “social”, I could have added online, blog, web, site, interact, magic, 4U, etc.. Perhaps you can add a prefix like “for”, 4 or go. Now that I thought up another social media name I liked, I had to check the major social media platforms to be sure that name is available. It seems like there’d be an online tool for something like that, right? There are and I used KnowEm. KnowEm is free and pulled up all of the major social platforms as well as hundreds that aren’t so popular and checked my brand’s new social name with each. 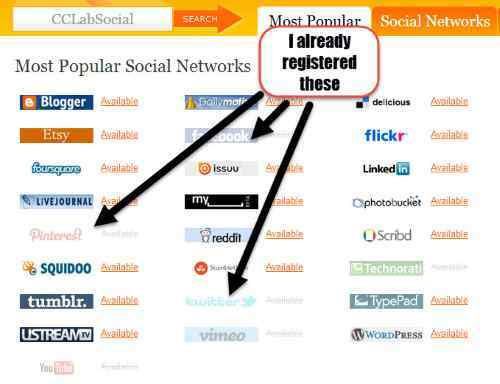 CCLabSocial was available on every network I wanted to maintain a social presence. Yay! As a little side note, I was playing around with KnowEm a couple of years ago when it showed HotBlogTips was available on YouTube; which I took advantage of and started the new channel that now has over 280 published videos. So you have your new social media identity for your new brand and you know its available on the networks you want to use – what’s next? Secure each one. This goes against what a lot of people would recommend but, I’ve said it before, secure your brand on every major social media platform. This doesn’t mean you need to spend a bunch of time on each of them right away, it just means to gain control of the name/url before it gets taken by someone else. Gmail: Gmail is super easy to get and you’ll need an email address separate from those already being used on sites that require it such as Twitter. You’ll need to log into that account to verify that accounts that require it. Note: I have MANY different Gmail accounts and I find it much easier to handle by setting each one to forward everything to my primary email address. Logo/Image: Eventually I will need a professional graphics for my logo and Podcast artwork but, for now, I created a five-minute logo using Canva and a $1 image. That gave me something to throw up on each profile, along with a simple bio. Ready, set, engage: I have a lot of time, I think, to work these social media profiles into respectable, content-loving tools. If I needed them right away, I’d get real active building a following of REAL and similar-minded people that are interested in my niche. Please don’t buy followers, that will hurt you and your teeth will fall out. There IS room for your brand on social media, you just may need to think outside the box. Don’t let a little hurdle like social media names derail your next project or business idea. If you have a future project in the works, secure a consistent and relevant identity for your brand right away, before someone else does.